The LiveLife Mobile Alarm comes with a Micro SIM card installed and activated. It therefore has it’s own mobile phone number which will be clearly marked in your paperwork that comes with your Mobile Alarm. Because of our size we’ve been able to negotiate a cellular solution that will pick the best available mobile signal based on your location at any time across Canada. Your Mobile Alarm will automatically select the best mobile tower in your area out of Rogers, Telus, Bell, MTS, Tbaytel and Sasktel using extended coverage. This SIM card comes with the first year of unlimited emergency voice calls and texts included. From Year 2 you’ll need to add $45 to cover the costs of using the Mobile Alarm for Year 2. We’ll remind you of this before it’s due. One of the great advantages of this solution is that you don’t need to check your credit and you don’t need to worry that your Mobile Alarm will run out of credit when you need it most. It’ll just work! These networks give the widest coverage across Canada and cover 99% of the Canadian population and cover 1.5 million square miles. These networks are ideal for a mobile personal medical alarm because of the wide coverages and the fact that Rogers, Telus, Bell, Tbaytel, MTS and Sasktel networks have great coverage in metro and rural areas. Basically, if you’re in an area in Canada where either a Rogers, Bell, Telus, Tbaytel, MTS or Sasktel mobile phone works fine then you can be sure your Mobile Alarm will work fine too. Most of the time checking the coverage map will be adequate to ascertain whether the Mobile Alarm will have a strong enough signal inside the home of the user. However as we know some homes can fall within coverage black spots due to hills, buildings and other obstructions. Ideally there should be between 1 to 2 bars or more on a Rogers, Bell, Telus, Tbaytel, MTS or Sasktel connected device inside the home as a guide. If you have a connected mobile phone that has a weak or inconsistent signal or have had visitors to your home who have experienced a weak mobile signal you may wish to discuss with us a SIM card from another provider as an alternative. Rogers, Bell, Telus, MTS, Tbaytel and Sasktel will be closing the 2G network soon. Most of the mobile alarms presently on the market continue to be limited to using 2G and therefore those alarms will stop working soon. The LiveLife mobile alarm works with a 3G chip and is compatible with all 3G, 4G & LTE phones. Why use the 3G network and not the newer 4G network? The LiveLife Mobile Alarm uses only the ‘Voice’ and ‘Text’ parts of the mobile network. The 4G mobile network is ideal for high speed data. This alarm does not use any data to perform any of it’s functions and therefore the best mobile network is 3G because it has wider coverage than the present Rogers, Bell, Telus, MTS, Tbaytel and Sasktel 4G/LTE mobile network. To find out about Usage Rates and Prepaid Credit click here. The Mobile Coverage Map is approximate only. Actual mobile alarm coverage depends on where you are and the device you are using. Customers should be aware that the mobile coverage maps displayed have been created using tools that predict the likely areas of coverage. Not every particular location within the identified coverage areas has been individually tested for coverage. This means that while the footprint of coverage outlined on the maps is generally accurate, there will be specific areas described as being within a coverage area where a customer’s mobile alarm will not work. This is a common characteristic of wireless systems. For example, coverage could be degraded or non existent in specific locations due to certain physical structures or geographic features or as a result of the device used. Physical structures which may block or inhibit coverage could include basements, lifts, underground car parks, concrete buildings, tunnels and road cuttings. Geographic features which may block or inhibit coverage could include formations such as hills and mountains or even trees. 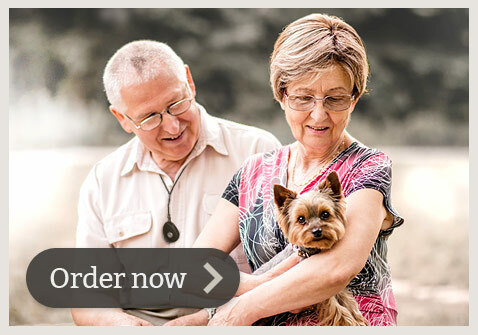 The LiveLife Mobile Alarm has built-in GPS technology that it uses to fix the location of the pendant with an accuracy of 2 metres. In order for the GPS functions to work it requires a line-of-sight connection to satellites in the sky. For the pendant to receive the signal it needs to be pointed to the sky. It normally takes a few seconds to receive the signal and work out the co-ordinates of it’s exact location. It can take up to 10 minutes to get it’s first fix out of the box. In the event that the pendant cannot receive the GPS signal it will revert to showing it’s last known position. This is the location of the device when it was last able to fix it’s location by satellite. The device conserves power by only trying to get a GPS fix when the device is moved. Because of this we cannot guarantee that when the device is activated the location given is always the current position at the time of activation or that when someone tries to locate it via text that it will know it’s current position. With that said, if the device does not know it’s current position it will report it’s last known position. This usually means the alarm has not moved significantly from it’s last known position so in most cases this is actually the true location of the Mobile Alarm. Underground carparks, lifts, concrete buildings, tunnels and other constructions can block the signal from satellites to the pendant. It is possible that if a wearer of the pendant is in a location where there is no GPS signal that there may also be no 3G mobile signal meaning the function of the pendant will not operate till the wearer moves to an unobstructed location.